To export your branded images, click Export from top right icons. The Export panel will be displayed. Enter the maximum width (pixels) of the exported images and the quality (1-100) you prefer in the available fields. Click the "+ Add to Batch Queue" link to add this session to your Batch Export List. If you have previously performed an export, the Recent Export Sizes will also be available to choose. You can choose as many sizes for your batch export as necessary. To add more sizes from the Recent Export Sizes list, click the size you want from the list and it will automatically be added to the Batch Export List. To remove a size from the Batch Export List, click the size you don't want and it will be deleted from the export list. If you have entered or selected multiple sizes for the batch export, a new folder will be created in your export location with the name of the size you set up for this session's export. This prevents the images from being overwritten with each exported size, as they will have the same filename. This toggle allows you to apply your style to an additional folder of images. When you click Yes, you'll be prompted to located the folder of images you want to include in the batch export. Once you've done this, the name of the folder will appear below the Additional Images toggle. The final step is to click Export to begin the export process. *Workflow Tip: A great way to save time is to create an Image Brander project and only import one image. 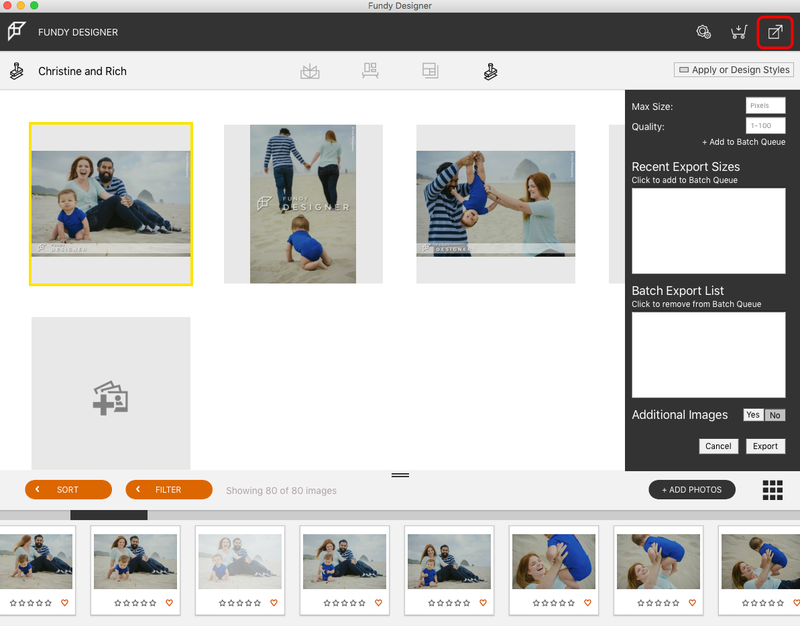 Once you select the style you want to apply and set up your export options, point it to an additional folder of images. This saves you time because you don't need to import the entire folder of images (i.e. a wedding) to your project to apply a style. Great way to quickly watermark and apply a style to a folder with a lot of images.